This article is about the British social class. For other uses, see Landed gentry (disambiguation). The landed gentry, or simply the gentry, is a largely historical British social class consisting in theory of landowners who could live entirely from rental income, or at least had a country estate. It was distinct from, and socially "below", the aristocracy or peerage, although in fact some of the landed gentry were wealthier than some peers, and many gentry were related to peers. They often worked as administrators of their own lands, while others became public, political, religious, and armed forces figures. The decline of this privileged class largely stemmed from the 1870s agricultural depression; however, there are still a large number of hereditary gentry in the UK to this day, many of whom transferred their landlord style management skills after the agricultural depression into the business of land agency, the act of buying and selling land. The designation "landed gentry" originally referred exclusively to members of the upper class who were landlords and also commoners in the British sense – that is, they did not hold peerages – but usage became more fluid over time. Similar or analogous social systems of landed gentry also sprang up in countries that maintained a colonial system; the term is employed in many British colonies such as the Colony of Virginia and some parts of India. By the late 19th century, the term was also applied to peers such as the Duke of Westminster who lived on landed estates. The book series Burke's Landed Gentry recorded the members of this class. Successful burghers often used their accumulated wealth to buy country estates, with the aim of establishing themselves as landed gentry. Baronets: a hereditary title, originally created in the 14th century and revived by King James in 1611, giving the holder the right to be addressed as Sir. Knights: originally a military rank, this status was increasingly awarded to civilians as a reward for service to the Crown. Holders have the right to be addressed as Sir, as are baronets, but unlike baronet, the title of knight is not hereditary. Gentlemen: possessors of a social status recognised as a separate title by the Statute of Additions of 1413. Generally men of high birth or rank, good social standing, and wealth, who did not need to work for a living, were considered gentlemen. All of the first group, and very many of the last three, were "armigerous", having obtained the right to carry a coats of arms. In many Continental societies, this was exclusively the right of the nobility, and at least the upper clergy. In France this was originally true but many of the landed gentry, burghers and wealthy merchants were allowed to register coats of arms and become "armigerous". The term landed gentry, although originally used to mean nobility, came to be used of the lesser nobility in England around 1540. Once identical, eventually these terms[clarification needed] became complementary, in the sense that their definitions began to fill in parts of what the other lacked. The historical term gentry by itself, so Peter Coss argues, is a construct that historians have applied loosely to rather different societies. Any particular model may not fit a specific society, yet a single definition nevertheless remains desirable. The phrase landed gentry referred in particular to the untitled members of the landowning upper class. The most stable and respected form of wealth has historically been land, and great prestige and political qualifications were (and to a lesser extent still are) attached to land ownership. The primary meaning of "landed gentry" encompasses those members of the land-owning classes who are not members of the peerage. It was an informal designation: one belonged to the landed gentry if other members of that class accepted one as such. A newly rich man who wished his family to join the gentry (and they nearly all did so wish), was expected not only to buy a country house and estate, but also to sever all financial ties with the business which had made him wealthy in order to cleanse his family of the "taint of trade". However, during the 19th century, as the new rich of the Industrial Revolution became more and more numerous and politically powerful, this expectation was gradually relaxed. From the late 16th-century, the gentry emerged as the class most closely involved in politics, the military and law. It provided the bulk of Members of Parliament, with many gentry families maintaining political control in a certain locality over several generations (see List of political families in the United Kingdom). Owning land was a prerequisite for suffrage (the civil right to vote) in county constituencies until the Reform Act 1832; until then, Parliament was largely in the hands of the landowning class. Members of the landed gentry were upper class (not middle class); this was a highly prestigious status. Particular prestige was attached to those who inherited landed estates over a number of generations. These are often described as being from "old" families. Titles are often considered central to the upper class, but this is certainly not universally the case. For example, both Captain Mark Phillips and Vice Admiral Sir Timothy Laurence, the first and second husbands of HRH The Princess Anne, lacked any rank of peerage, yet could scarcely be considered anything other than upper class. The agricultural sector's middle class, on the other hand, comprise the larger tenant farmers, who rent land from the landowners, and yeoman farmers, who were defined as "a person qualified by possessing free land of forty shillings annual [feudal] value, and who can serve on juries and vote for a Knight of the Shire. He is sometimes described as a small landowner, a farmer of the middle classes." Anthony Richard Wagner of the Richmond Herald wrote that "a Yeoman would not normally have less than 100 acres" (40 hectares) and in social status is one step down from the gentry, but above, say, a husbandman. So while yeoman farmers owned enough land to support a comfortable lifestyle, they nevertheless farmed it themselves and were excluded from the "landed gentry" because they worked for a living, and were thus "in trade" as it was termed. Apart from a few "honourable" professions connected with the governing elite (the clergy of the established church, the officer corps of the British Armed Forces, the diplomatic and civil services, the bar or the judiciary), such occupation was considered demeaning by the upper classes, particularly by the 19th century, when the earlier mercantile endeavours of younger sons were increasingly discontinued. Younger sons, who could not expect to inherit the family estate, were instead urged into professions of state service. It became a pattern in many families that while the eldest son would inherit the estate and enter politics, the second son would join the army, the third son go into law, and the fourth son join the church. Persons who are closely related to peers are also more correctly described as gentry than as nobility, since the latter term, in the modern British Isles, is synonymous with "peer". However, this popular usage of 'nobility' omits the distinction between titled and untitled nobility. The titled nobility in Britain are the peers of the realm, whereas the untitled nobility comprise those here described as gentry. David Cannadine wrote that the gentry's lack of titles "did not matter, for it was obvious to contemporaries that the landed gentry were all for practical purposes the equivalent of continental nobles, with their hereditary estates, their leisured lifestyle, their social pre-eminence, and their armorial bearings". British armigerous families who hold no title of nobility are represented, together with those who hold titles through the College of Arms, by the Commission and Association for Armigerous Families of Great Britain at CILANE. Equally wryly, Oscar Wilde referred to the Peerage as "the best thing in fiction the English have ever done". In the 1830s, one peerage publisher, John Burke, expanded his market and his readership by publishing a similar volume for people without titles, which was called A Genealogical and Heraldic History of the Commoners of Great Britain and Ireland, enjoying territorial possessions or high official rank, popularly known as Burke's Commoners. Burke's Commoners was published in four volumes from 1833 to 1838. Subsequent editions were re-titled A Genealogical and Heraldic History of the Landed Gentry; or, Commons of Great Britain and Ireland or Burke's Landed Gentry. Burke's Landed Gentry continued to appear at regular intervals throughout the 19th and 20th centuries, driven, in the 19th century, principally by the energy and readable style of the founder's son and successor as editor, Sir John Bernard Burke (who generally favoured the romantic and picturesque in genealogy over the mundane, or strictly correct). Landed Gentry used to limit itself to owners of domains that could properly be called "stately" (i.e. more than 500 acres or 200 hectares). Now it has lowered the property qualification to 200 acres (0.81 km2) for all British families whose pedigrees have been "notable" for three generations. Even so, almost half of the 5,000 families listed in the new volume are in there because their forefathers were: they themselves have no land left. Their estates are mere street addresses, like that of the Molineux-Montgomeries, formerly of Garboldisham Old Hall, now of No. 14 Malton Avenue, Haworth. The last three-volume edition of Burke's Landed Gentry was published between 1965 and 1972. A new series, under new owners, was begun in 2001 on a regional plan, starting with Burke's Landed Gentry; The Kingdom in Scotland. However, these volumes no longer limit themselves to people with any connection, ancestral or otherwise, with land, and they contain much less information, particularly on family history, than the 19th and 20th century editions. 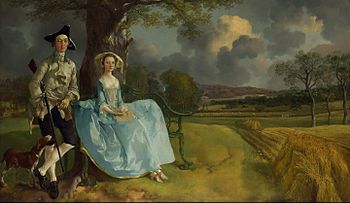 The popularity of Burke's Landed Gentry gave currency to the expression Landed Gentry as a description of the untitled upper classes in England (although the book also included families in Wales, Scotland and Ireland, where, however, social structures were rather different). An alternate name was employed by the publishers of a similar, though less genealogical, series, known as Walford's County Families, wherein the term county family referred more or less to the same people Burke covered by the term, landed gentry. They were also known as the upper ten thousand. 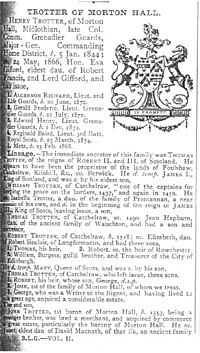 Families were arranged in alphabetical order by surname, and each family article was headed with the surname and the name of their landed property, e.g. "Capron of Southwick Hall". There was then a paragraph on the owner of the property, with his coat of arms illustrated, and all his children and remoter male-line descendants also listed, each with full names and details of birth, marriage, death, and any matters tending to enhance their social prestige, such as school and university education, military rank and regiment, Church of England cures held, and other honours and socially approved involvements. Cross references were included to other families in Burke's Landed Gentry or in Burke's Peerage and Baronetage: thus encouraging browsing through connections. Professional details were not usually mentioned unless they conferred some social status, such as those of civil service and colonial officials, judges and barristers. After the section dealing with the current owner of the property, there usually appeared a section entitled Lineage which listed, not only ancestors of the owner, but (so far as known) every male-line descendant of those ancestors, thus including many people in the ranks of the "Landed Gentry" families who had never owned an acre in their lives but who might share in the status of their eponymous kin as connected, however remotely to the landed gentry or to a county family. The Great Depression of British Agriculture at the end of the 19th century, together with the introduction in the 20th century of increasingly heavy levels of taxation on inherited wealth, put an end to agricultural land as the primary source of wealth for the upper classes. Many estates were sold or broken up, and this trend was accelerated by the introduction of protection for agricultural tenancies, encouraging outright sales, from the mid-20th century. So devastating was this for the ranks formerly identified as being of the landed gentry that Burke's Landed Gentry began, in the 20th century, to include families historically in this category who had ceased to own their ancestral lands. The focus of those who remained in this class shifted from the lands or estates themselves, to the stately home or "family seat" which was in many cases retained without the surrounding lands. Many of these buildings were purchased for the nation and preserved as monuments to the lifestyles of their former owners (who sometimes remained in part of the house as lessees or tenants) by the National Trust for Places of Historic Interest or Natural Beauty. The National Trust, which had originally concentrated on open landscapes rather than buildings, accelerated its country house acquisition programme during and after the Second World War, partly because of the widespread destruction of country houses in the 20th century by owners who could no longer afford to maintain them. Those who retained their property usually had to supplement their incomes from sources other than the land, sometimes by opening their properties to the public. In the 21st century, the term "landed gentry" is still used, as the landowning class still exists, but it increasingly refers more to historic than to current landed wealth or property in a family. Moreover, the deference which was once automatically given to members of this class by most British people has almost completely dissipated as its wealth, political power and social influence have declined, and other social figures such as celebrities have grown to take their place in the public's interest. ^ See The Concise Oxford Dictionary, edited by H.W. & F.G.Fowler, Clarendon Press, Oxford, 1972 reprint, p. 1516; note the definition does not apply to 1972, but to an earlier time. ^ English Genealogy, Oxford, 1965, pps: 125–30. ^ "Esquire", Penny cyclopedia, 9–10, Society for the Diffusion of Useful Knowledge, p. 13, retrieved 12 March 2012 . ^ Larence, Sir James Henry (1827) [first published 1824]. The nobility of the British Gentry or the political ranks and dignities of the British Empire compared with those on the continent (2nd ed.). London: T.Hookham -- Simpkin and Marshall. Retrieved 6 January 2013. ^ Cannadine, David (1999). The Decline and Fall of the British Aristocracy. Vintage Books. ^ Copeland, Edward; McMaster, Juliet (2011). The Cambridge Companion to Jane Austen. Cambridge University Press. ISBN 9780521763080. ^ Ormerod, George (1907). Index to the Pedigree in Burke's Commoners: Originally Prepared by George Ormerod in 1840. Provost of Queen's College. ^ "Foreign News: Twentieth Century Squires". Time. 10 December 1951. Retrieved 14 January 2013.